Whether you’re on the highway or a street in your neighborhood, road construction is a way of life for all drivers. 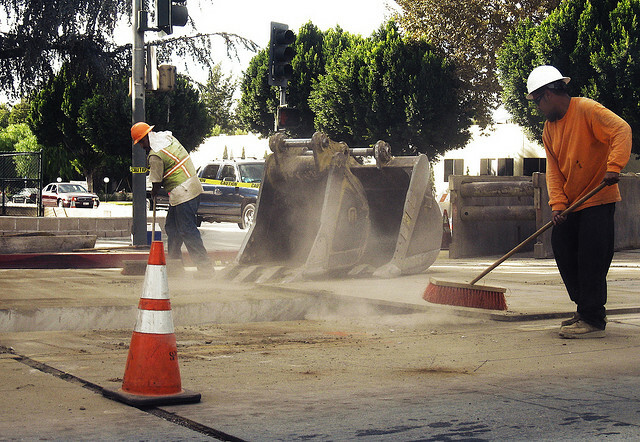 During the summer there is more construction going on than ever and not only can construction zones be dangerous for drivers, they can also pose a danger to the workers as well. Keep these safety tips in mind next time you end up driving through a construction zone. The best piece of advice we can give when it comes to construction zones is to avoid them. Not only do they cause traffic, the more cars there are the more potential there is for an accident. 511 is know as America’s Traveler Information Telephone Number and can provide you with the best and safest routes available, even if you’re just commuting to work. You can find information about various coverage areas from 5:30 a.m. until 9 p.m. Monday-Friday, and from 10 a.m. until 7 p.m. on weekends and holidays. You can visit their website to get real-time traffic updates and create customized alerts! Another great tool we love? The Waze traffic app that is updated in real time by other users on the road and provides the best and most updated routes taking traffic into consideration. If you do find yourself approaching one of those bright orange signs reading “construction ahead” and don’t have time to take an alternate route, make sure you obey the posted speed limit. Speeding is one of the biggest hazards for both drivers and construction workers. If you’re speeding 10 miles over the limit and suddenly need to change lanes, you could potentially cause a major accident if you’re not able to get over in time. You will also face big fines if you’re caught speeding in a construction zone, typically they are doubled and police officers do not take enforcement lightly. When it comes to merging, the biggest risk factors are merging too late or at a high speed. Both can result in deadly collisions and even if an accident does not occur, no one likes that person that waits until the last possible second to merge in an attempt to beat just a few more cars. Get over as soon as possible and make sure you are going at a speed that is safe for yourself and your fellow drivers. Be aware! You need to be totally focused on your surroundings, not only the other cars, construction signs, and detours, but also the workers and their vehicles. Construction vehicles may be working closely to the highway and it’s important to make sure they are able to see you as many have bad blind spots. Some of them may even move onto the highway and come extremely close to oncoming traffic, and are slow to maneuver if an emergency ever did arise. Workers are often located on the shoulders of highways so keep an eye out for them as well. As always, safety is the top priority when it comes to driving. Even though construction zones can be painful to sit through and delay your commute, they are unavoidable and it’s important to be as safe as possible when you find yourself in one.